How does the latest Galaxy handset compare to its wildly popular predecessor? It’s been nearly a year since the Samsung Galaxy S4 launched, and after numerous leaks, rumors and high expectations, the Korean tech giant finally lifted the veil on the next gadget in the Galaxy S series. The Samsung Galaxy S5 was made official during the Mobile World Congress in Barcelona, and the blogosphere went wild over it. Samsung is one of the most prominent smartphone manufacturers in the world, and for good reason. The Galaxy S series is also one of the most popular lineups in the mobile niche, and with each new device, Samsung manages to catch the attention of every gadget enthusiast out there. The Galaxy S5 makes no exception, so let’s take a look at what the next best thing from the Korean manufacturer has to offer. Ever since Samsung made a name for itself in the high-end smartphone market, one of the biggest criticisms has been the somewhat lack-luster design of its devices. While they usually come with sleek profiles and thin bezels, certain potential customers have been put off by the “plastic feel” offered by most high-end Samsung smartphones. Fortunately, the situation has improved during the past year or so, and with the Note 3 Samsung pushed a new design philosophy for its handsets. The Samsung Galaxy S5 comes with an improved design, and while it still uses plastic as the main material for the case, the rear panel features a perforated pattern that looks quite appealing. The company has also expanded the range of colors available at launch, as the S5 will be retailed in Charcoal Black, Shimmery White, Electric Blue and Copper Gold. Perhaps the biggest change is the fact that the SGS5 is IP67 certified, thus confirming earlier rumors that the device will be just as dust and waterproof as the Galaxy S4 Active. The smartphone can survive being submerged in up to one meter of water for about 30 minutes. While it hasn’t been removed as some people would’ve hoped, the physical home button now features a swipe fingerprint scanner that provides biometric authentication and allows the user to perform secure mobile payments. Last but not least, the S5 also comes with a heart rate monitor, which has been embedded in the back panel, underneath the main camera. While the Galaxy S5 is a pretty looking device, at least in our opinion, there’s more to it than meets the eye. The S5 packs a 5.1-inch Super AMOLED display protected by Corning Gorilla Glass 3. While this year we expect 2K / QHD screen resolutions to become mainstream, the SGS5 features a resolution of 1080 x 1920. This results in a pixel density of roughly 432 pixels per inch. This should be enough for any smartphone user out there, but if it isn’t then you might be glad to learn that previous rumors hinted at a QHD SGS5 model which could be launched several months after the original model. Moving on, the S5 is powered by the latest Snapdragon 801 SoC, boasting a quad-core CPU clocked at 2.5 GHz. The CPU is combined with an Adreno 330 graphics chip and 2 GB of RAM. Needless to say, the device is quite a beast, and should sit at the top of various benchmark lists for a good period of time. Storage-wise, the SGS5 comes with 16 / 32 GB of internal storage, and while it appears that 64 GB might not be an option, the smartphone features a microSD card slot that can read cards up to 128 GB. The new Broadcom BCM4354 6G SoC also makes the Galaxy S5 the first smartphone in the world to feature Wi-Fi 2×2 (or MIMO / Multiple Input Multiple Output). This gives the handset the same multiple antenna capabilities that are normally found in home wireless networking devices and certain tablets. More so, the SGS5 offers LTE-A Cat4 support, which in theory should allow the smartphone to achieve download speeds of up to 150Mbps. Evidently, this will differ from one carrier to another, and various other factors. Samsung has also implemented a new feature of its own called “Download Booster.” This feature takes advantage of the Wi-Fi/ac and LTE-Advanced capabilities of the device, combining them into achieving faster download speeds. In a nutshell, it works by allowing the users to download files larger than 30 MB using both Wi-Fi and LTE simultaneously. Aside from shutting down certain processes that aren’t necessary, this new feature makes the display show images in black and white only. With an AMOLED panel, a black background usually means that most of the pixels are inactive. In theory, this should greatly improve battery life. There have been numerous questions regarding the camera capabilities of the Galaxy S5. After all, we live in a world where casual photographers oftentimes replace point-and-shoot devices with their smartphones. Fortunately, Samsung brought further improvements in the camera department. The S5 packs a 16 MP shooter with an f/2.2 aperture and a 1/2.5″ sensor, boasting 1.1 micron pixels. The unit supports an advanced HDR mode (High Dynamic Range) which is available for both video recording and photo shooting, and the new ISOCELL technology promises improved shooting in low light conditions and better exposure. Sadly, there has been no mention of Optical Image Stabilization. In the video department, the camera is capable of [email protected] fps recording, while also including selective focus, which gives the user the ability to create a shallow depth of field effect without the need of special lenses. As expected, the Galaxy S5 comes with Android 4.4.2 KitKat out of the box. Nevertheless, as is the case with most smartphones that feature proprietary user interfaces, SGS5 owners will barely notice any KitKat-specific software features. The highlight is of course the new TouchWiz user interface developed by Samsung. Design-wise, the new UI introduces several improvements, including reworked menus as well as rounder, flatter icons. There are also a wide range of new features to look forward to, including a greatly improved S Health application that works in conjunction with the heart rate sensor mentioned above. The application continues to offers the usual range of options, including a pedometer as well as exercise and diet recordings. Undeniably, the Galaxy S5 is an impressive high-end smartphone, and we’re pretty confident that it will be a great success like the S4 before it (or even greater). Set to launch in April 11 across 150 countries, the smartphone will most likely hit the shelves at a price tag of roughly $600. 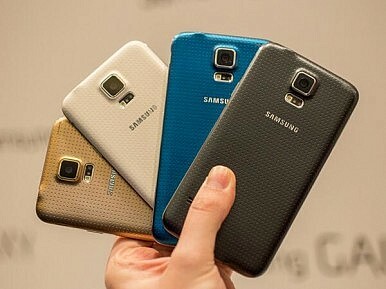 On-contract, chances are that the Galaxy S5 will cost around $199, and in the US, four carriers have already confirmed that they will release the S5 on their networks. This includes AT&T, T-Mobile, Sprint and MetroPCS. Both Verizon and U.S. Cellular have not made any official announcements yet. The device will be available through a wide range of retailers, including Radioshack, Amazon, Walmart, Costco, Best Buy, Target and Sam’s Club. That’s about it ladies and gentlemen: the SGS5 is official and is getting close to the finish line. It’s time to share your opinion on the device by leaving a comment below. Is Samsung’s next flagship phone the device that you were hoping for? Amazon’s new offering is a worthy rival to Samsung’s popular smartphone.